I’m the worst sometimes. I really am. I talk all this big talk about changing my neglectful blogger ways, I put up a couple of posts, and then… I go off the grid. So, uhm, sorry about that, if you care. It’s just that I’ve been kinda busy recently, not with any one thing in particular, but just the usual business of living: working, running, forgetting, laughing, coping, traveling, turning 30 (!!! ), rinsing and repeating. But rest assured, mixed throughout I’ve had some great food. Some healthy, some not, some bizarre, some more normal, and then hybrids like this guy: the ramenritto from the somewhat random West Village cafe, Press Tea. 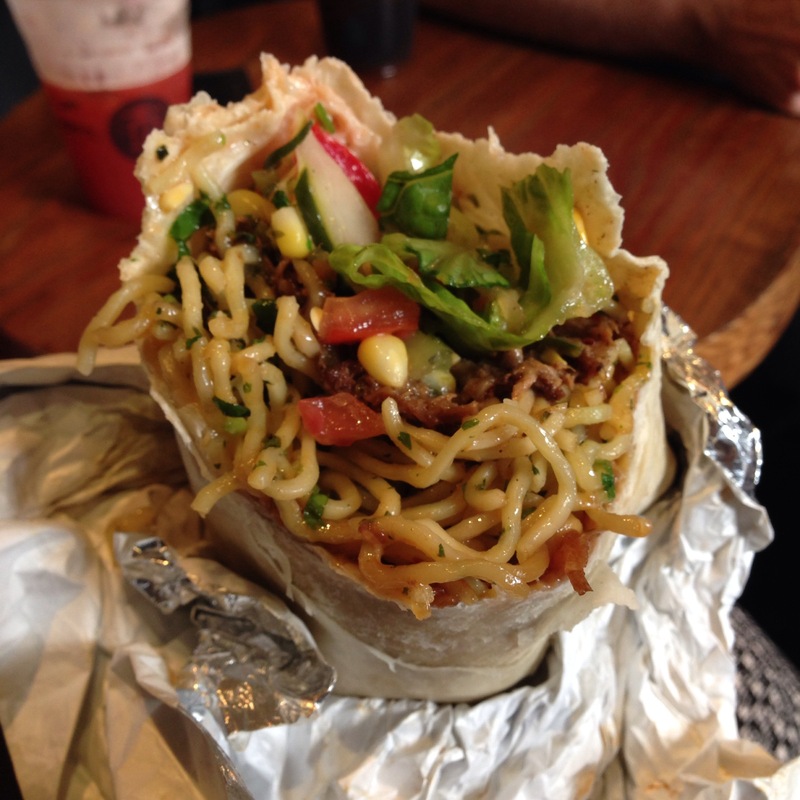 The ramenritto: a burrito stuffed with ramen. Ramen burgers (a burger sandwiched between ramen instead of buns) have been have been having a moment in New York recently, but the ramenritto is, as the name might suggest, a burrito stuffed with ramen. Along with a ton of noodles, each ramenritto is stuffed with saucy, flavorful veggies including corn, onions and greens, and a meat, in my case pork. I’ve been trying to watch my carb intake recently (you know, now that I am a woman of a certain age) so this is definitely not something I can say I’ll be eating frequently but for the novelty that it is, I rather enjoyed it. The whole thing had a sort of mushy consistency to it, but if that’s not a problem for you, the ramenritto could be a good time. If nothing else, I could see myself getting stoned and absolutely loving the ramenritto. Now, what was that I was saying about turning 30? This entry was posted in Dinner and tagged burrito, Press Tea, ramen, ramenritto, West Village. Bookmark the permalink. I’ll leave that one to you to eat…maybe in a crunchy outer wrap?